This section contains information related to Malmo Aviation, flight code TF, a low-cost carrier regional type. "The low-cost product of Malmo Aviation is also known as Snalskjutsen, it started operations at 2002. 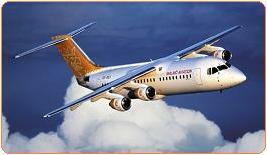 Malmö Aviation has a fleet of 9 AVRO RJ 100s.These British-built aircraft are ultra-quiet four-turbofan airliners capable of carrying 112 / 96 passengers"
'Snalskjutsen' is a low-cost product of Malmo Aviation. Click to browse to the network development section of this site, featuring more more information on the network development of Malmo Aviation.